Ghee or Tup or Clarified Butter is an integral part of Indian food - mithai (sweets), parathe, rice and many other delicacies. Even dosas taste great when roasted with ghee. Indian festivities and religious ceremonies are incomplete without shudh desi ghee. Heat a heavy bottom pan. Make sure there is no water or moisture in the pan. Add butter. Once the butter melts, add cloves and lower the heat. Let the butter cook at low heat until the foam reduces. You will also hear some crackling sound, which will reduce once the foam starts to disappear. Use a spoon to check if the foam has reduced and a clear liquid is visible. Also, the milk solids will settle at the bottom. Turn off the heat. Do not let the milk solids turn brown. Cloves add a nice aroma to the clarified butter which can be used for both sweet and savory dishes. Some add fenugreek (methi) seeds or Tulsi (Sacred Basil) leaves. Let the clarified butter cool for 15 - 20 minutes. Using a dry strainer pour the clarified butter into dry glass jars. Let the ghee cool down completely before closing the jars. Ghee will solidify at room temperature. Ghee stays fresh at room temperature for a month or so. You can also refrigerate ghee, if you don't use it more often. The leftover milk solids can be used for Tadka Dal or for any gravy curry. You can also add these milk solids to chapati/roti dough for soft rotis. Enjoy ghee with roti, parathe, idlis, dosas, biryani, pulav, popcorn etc. 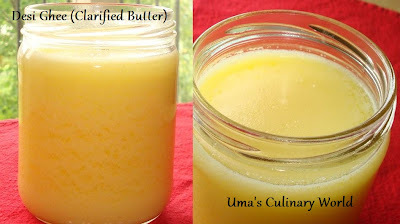 I too make ghee at home.....Never added clove in the process...useful post..